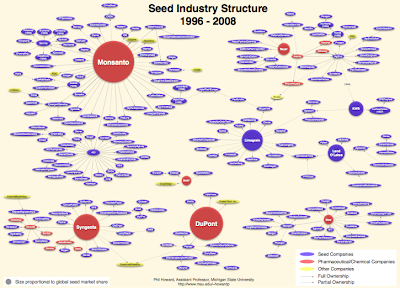 Monsanto supplies proprietary traits to 85 percent of corn planted in the United States, and 92 percent of soy. Corn and soy are the lifeblood of the U.S. food system. If you eat a standard diet, you’re ingesting a Monsanto-originated product with just about every bite you take. Nor is the company a benign monopolist, the report shows. GMO corn seeds have jumped from $110 per unit in 1999 to upwards of $190 by 2008; for soy, prices soared from less than $25 to more than $40. But this monopoly isn't just bad for farmers' livelihoods; it's bad for the resilience of our ecosystem. We have 71 percent of U.S. cropland being used for just three crops, and a small handful of companies supplying the seeds. 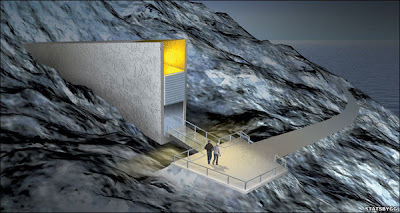 That's a precarious situation, and it's why projects like the Seed Vault are important. There's a bigger version of the chart here.